Donnafugata – a woman in flight. 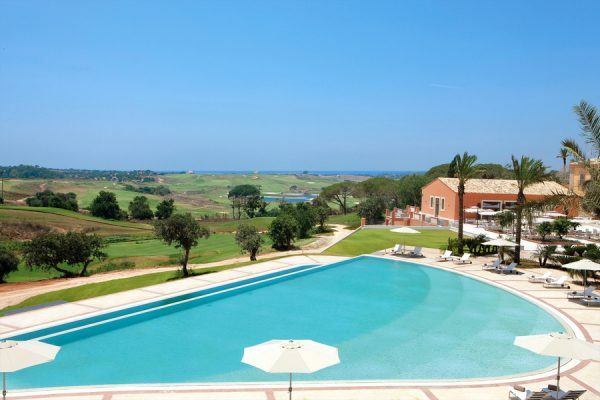 The 5-star luxury Donnafugata Golf Resort & Spa is a heavenly place for anyone wishing to play golf and to experience a great time in one of the most enchanting places in Sicily. Located close to Archeological Park of Kamarina and possesses a unique ambience and charm and has been host for the Sicilian Open on two occasions on the European PGA Tour. It has two fantastic golf courses, a private beach, three restaurants and it serves great italian cuisine. The property’s spa has body treatments, massage/treatment rooms, facials, and beauty services. Beside this the place offers meeting rooms and amazing food. The highlight are the two championship golf-course. Amazing, sunny wheater and a fantastic green architecture. Let’s say the Donnafugata is a lovely ranch style country resort, but the highlight of the hotel however are the Championship golf courses, which lie adjacent, it is really a hotel for golfers only. One of the courses has the design of Gary Player, one the best in the world and a classic challenge. In the evening You should try the wine Bar, the ideal destination for those seeking an activity break, with time to relax. There are a few nice Donnafugata wines which are a passionate interpretation of Sicily and its sensorial universe. Donnafugata was founded in Sicily by an enterprising family with 160 years’ experience in premium wines. Giacomo Rallo and his wife Gabriella, with their children José and Antonio, are engaged in an entrepreneurial project aimed at care for details to make wines that increasingly correspond to the territory’s potential. The Donnafugata adventure began in 1983 in the Rallo family’s historic cellars in Marsala and at its Contessa Entellina vineyards in the heart of western Sicily; In 1989, Donnafugata arrived on the island of Pantelleria, starting to produce naturally sweet wines. The name Donnafugata, literally “woman in flight” refers to the history of Queen Maria Carolina of Bourbon, who in the early 1800s sought refuge in that part of Sicily where the winery’s vineyards now stand. It was the Sicilian author Giuseppe Tomasi di Lampedusa, in his novel Il Gattopardo (The Leopard), who gave the name of Donnafugata to the country estates of the Prince of Salina which hosted the queen and now host the winery’s vineyards. The Resort lies near the town of Ragusa, the cradle of Sicilian Baroque with its neighboring towns listed among the pearls of the UNESCO World Heritage Sites: Modica and Scicli, unique landscapes and just gorgeous food. It became famous as location for famous movie productions, such as the Italian television series “Il Commissario Montalbano” besides the internationally renowned masterpiece “Il Gattopardo” with Burt Lancaster by L. Visconti. In the 1860s, a dying aristocracy struggles to maintain itself against a harsh Sicilian landscape. The film traces with a slow and deliberate rhythm, the climatic scene is a sumptuous forty-minute ball, a fantastic movie. It is easy to get there, the international airport of Comiso, is located just 17 km from the resort. Resto tip in Roma on the way back. Pergola is within the impressive Hilton Cavalieri hotel, which is perched at the top of a hill overlooking the city. The dining room in on the 9th floor, has fine views out over the city, and is lavishly decorated. The owner of the hotel has a reputedly vast art collection, and the dining room has several pieces on display, including paintings, glassware and furniture. The room has a blue/gold patterned carpet, picture windows and generously spaced tables. Pergola is laid out along one side of the hotel in which it is situated, the dining room snaking along the top of a hillside overlooking Rome; this layout means that most tables have at least some part of the view, and a spectacular view it is. All of Rome sprawls beneath you, with St Peter’s Basilica just one of the clearly visible landmarks. The dining room itself is lavishly decorated, with mirrors along the rear wall and lovely pieces of art dotted around the room. Salmon with a little fennel salad and tangerine sauce was the introductory taste, and although the combination is perfectly sensible and the fennel was good. The meal got into its stride with a duck liver terrine with smoked apple, almonds and amaretti. This was spectacularly good dish, the terrine having stunning flavour, the apple providing just enough balancing acidity. Deep fried zucchini flower with caviar on shellfish and saffron sauce was a pretty dish, the courgette flower arranged in a star, the sauce having clean flavours. First of a trio of pasta dishes was “Mezza lune” with broccoli, squid and clams. This was extremely delicate, and mix of shellfish and broccoli worked well Fagotelli “La Pergola” is a feature of the menu here, and has remarkably light pasta. Tangerine risotto with scampi carpaccio and mint was technically skilled and had lovely langoustines. Following the pasta was a Cannolo of scampi and vegetables, olive sauce and tapioca with Campari. The langoustines were extremely good, though they are a delicate taste that for us got a little lost amongst the powerful flavour of the olive sauce and the Campari. Warm emincé of sea bass with vegetables marinated in olive oil was impressive, the fish itself perfectly cooked and with lovely flavour, the excellent vegetables giving a nice light balance to the dish, and a again a sense of the tastes being very clean and pure came through in this dish. A warm Emincé of hunter’s style rabbit on sweet pepper cream was also successful, the pepper cream superb with intense, pure flavour, the rabbit excellent. The final savoury course was liquorice-flavoured shoulder of Iberian suckling pig with herbed potatoes. I am not personally that keen on liquorice as a flavour, but it was well controlled here, and the pork itself was of very high quality. A trolley contained an entirely Italian cheese selection, the cheeses in very good condition. I found a local goat cheese that superficially resembled St Maure was particularly impressive, but the better known cheeses such as Taleggi, Gorgonzola were all delicious. Thats was more than enough. Finally orange jelly with bice cream, it was a very pretty dessert. The wine list is immense, two large tomes, one for Italian wines, one for the rest of the world. A proper 3 star restaurant. The restaurant is an space that feels refined and intimate at the same time. More modern in overall design than the hotel itself with its evocation of the ’30s and ’40s, the restaurant includes artwork, chosen by the same gallery as the rest of the hotel, serves as the unifying element. 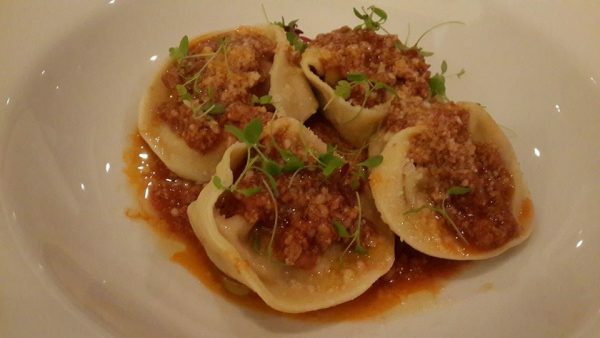 Traditional recipes are augmented for a modern palate. The hotel has established a program called the ‘Wines of Italy’ which allows you to order a broad selection of fine Italian wines by the glass instead of by the bottle. This lets me taste and experience wines from among a selection of 32 labels from all over Italy. Should you want a bottle, the 600-label wine list is the province of the Restaurant Manager, Federico Galligani, an enthusiastic sommelier. The wine cellar, di Vino, also permits guests to visit and engage in wine tastings and even dine in complete tranquility.